Grossmont stays cool in hot conditions on Saturday. 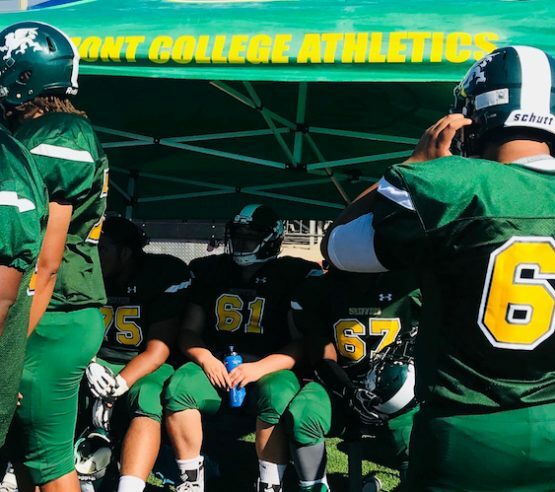 LA MESA – The Grossmont College Griffins showed their promise, taking a 14-7 lead early in the second quarter, but visiting College of the Canyons scored the rest of the points in a 43-14 win at Grossmont High’s Lt. Adams Stadium on Saturday. The Griffins erased an early 7-0 deficit with a pair of touchdowns less than three minutes apart. With 2:44 left in the first quarter, FABIAS SHIPMAN III scored on a 1-yard plunge to tie the game. Then, on the first play of the second quarter, JARIUS BURNETTE had a 34-yard touchdown run to give Grossmont (0-2) the lead with 14:56 to go in the half. However, Canyons scored three touchdowns in the second quarter for a 24-14 halftime lead. The Griffins committed seven turnovers in the contest. Grossmont quarterback ANTHONY POSADA passed for 192 yards, while Burnette finished with 113 yards rushing. “We came out ready to play,” Grossmont offensive lineman JAY WILLIAMS said. “The offense is moving the ball better and we are starting to get everything together as a team. Griffin sophomore receiver WILTON CRAVENS had six catches for 76 yards, while freshman teammate JACOB ROZAR, another former Bonita Vista Baron, had five receptions. Grossmont’s ANDREW LIRA, a Grossmont High grad playing on a familiar surface, had an interception, a fumble recovery, and a pass breakup, while teammate PRESTON PILTOFF had an interception, as well. Freshman outside linebacker DARIAN WILLIAMS, from Otay Ranch High, led Grossmont with eight total tackles, while sophomore DACHELLE JOHNSON, out of Mount Miguel high, had five total stops, two for loss, including a sack. The Cougars (2-0) forced seven turnovers and had more than 500 yards of total offense. COC sophomore quarterback Andrew Brito had 368 yards and three scoring strikes. Jarrin Pierce led all receivers with seven catches for 170 yards and a touchdown. A week after limiting to Saddleback College to just six points, the Cougars shook off some first-half miscues and proceeded to shut out the Griffins in the second half. COC entered the game ranked No. 6 in the state according to the JC Athletic Bureau Head Coaches Poll and No. 7 in the California Community College Sports Information Association (CCCSIA) Poll. Grossmont is at Mt. San Jacinto next Saturday, Sept. 15 for a 1 p.m. start. 1 10:34 Canyons – Cayden Dunn 7 yd run. (Tanner Brown kick is good). 1 02:44 Grossmont – Fabias Shipman III 1 yd run. (Ethan Albertson kick is good). 2 14:52 Grossmont – Jarius Burnette 34 yd run. (Ethan Albertson kick is good). 2 11:44 Canyons – Tanner Brown 24 yd field goal. 2 08:40 Canyons – Jarrin Pierce 64 yd pass from Andrew Brito. (Tanner Brown kick is good). 2 01:12 Canyons – Tim Wiggins 10 yd pass from Andrew Brito. (Tanner Brown kick is good). 3 10:13 Canyons – Brandon Pierce 19 yd pass from Andrew Brito. (Tanner Brown kick is good). 3 04:53 Canyons – Tanner Brown 36 yd field goal. 4 13:38 Canyons – Tanner Brown 47 yd field goal. 4 05:01 Canyons – Tanner Brown 46 yd field goal.